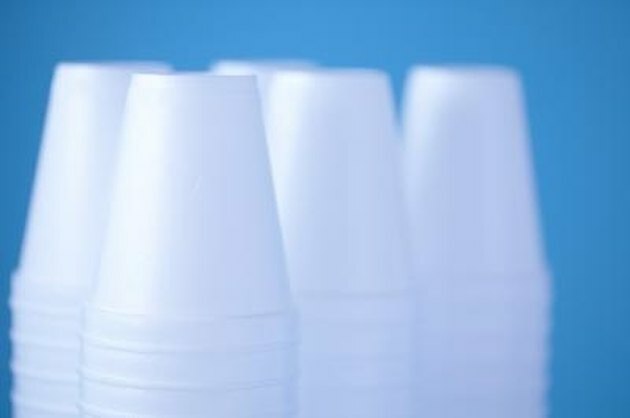 Polystyrene is a very inert, nonreactive substance -- one of the properties that make it so useful for packaging. It doesn't dissolve at all in water or alcohols either. Some chemicals, however, can dissolve or eat through Styrofoam, and a few of these are substances you might actually have around your home. Polystyrene is very nonreactive and does not dissolve in water. Acetone is a handy solvent found in nail polish remover and paint-store denatured alcohol. It can rapidly dissolve or eat its way through Styrofoam. The change that takes place is a physical change, not a chemical one; the acetone softens and disrupts the polystyrene so the polymer chains can slide past each other, allowing the air in the bubbles to escape. Styrofoam is mostly air, so you can condense its volume to an amazing extent by adding acetone. Nonetheless, you don't want to store nail polish remover in Styrofoam cups. Like polystyrene, the compounds found in gasoline are all very nonpolar, meaning electrons are equally shared in bonds in the molecule so there aren't any partial charges. Styrene includes lots of aromatic groups, and gasoline contains some aromatic compounds like toluene and xylene. A general rule is that "like dissolves like," and gasoline can indeed attack Styrofoam. Kerosene will do likewise. You wouldn't want to store gasoline in a Styrofoam cup anyway because it evaporates readily as it's quite volatile and is highly flammable. Some natural oils can soak into the polystyrene or dissolve it, especially at higher temperatures. Some grades of fish oil and limonene from lemon oil are two examples. Vegetable oil doesn't dissolve Styrofoam at room temperature, and saturated fats are similar, although at high temperatures pan drippings can eat into polystyrene. Eucalyptol, which is found in eucalyptus, rosemary and bay oil, can dissolve Styrofoam; the oil cymene, which is found in thyme, can do the same. 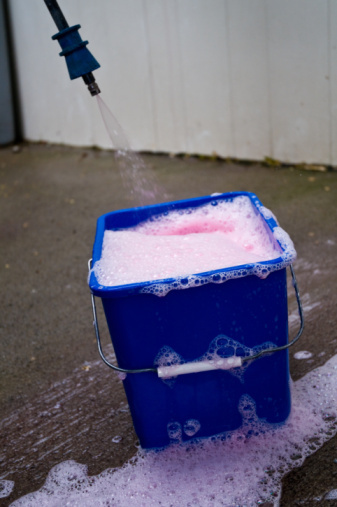 Any other organic solvents you have around your home may dissolve Styrofoam. Plastic model glue with toluene in it, for example, will do the trick as will the solvents in brake cleaner and throttle body cleaner -- two substances you may use when working on cars. Motor oil and silicone oils, by comparison, will not eat their way into Styrofoam. Ethyl acetate, another organic solvent found in some fingernail polish removers, will also attack Styrofoam. What Can Be Used to Dissolve Silicone Caulking? Is Styrofoam a Fire Hazard?